It’s the end of December, and I’m back in Arizona. 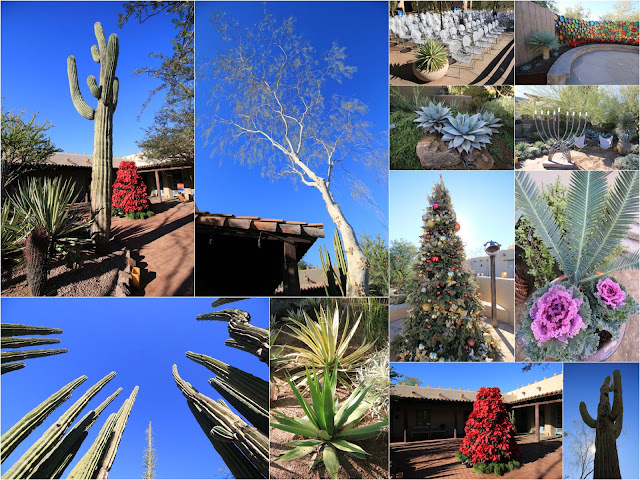 This is my fourth December trip to Arizona in a row (2013 | 2014 | 2015) so I suppose it’s OK to call it a tradition now. This time I flew because I could only carve out five days. Instead of buying what I want and tossing it in the car, like on the previous two trips, anything I buy has to fit in my suitcase. We’ll see how that goes. I arrived in Phoenix last evening—late because a gas cap was missing on our plane and a mechanic had to check it out before leaving Sacramento. That wouldn’t have been so bad, but when I got to the Hertz counter at Phoenix Sky Harbor (“The Friendliest Airport in America”) to pick up my rental car, it turned out that they had run out of cars. And yes, they blamed it on Christmas, as if Christmas had somehow snuck up on them. At least a dozen disgruntled customers were in the same boat. In essence, we had to wait until cars were dropped off and could be cleaned. In my case it took “only” 30 minutes (some people apparently had to wait longer), but I’m still pissed at Hertz. Instead of apologizing to us, the sentiment among the Hertz employees was that we should be more sympathetic to their situation. Not cool. I’m done with Hertz and will rent elsewhere from now on. One a much more positive note, my visit to the Desert Botanical Garden (DBG) this morning was fantastic. Just like it always is. 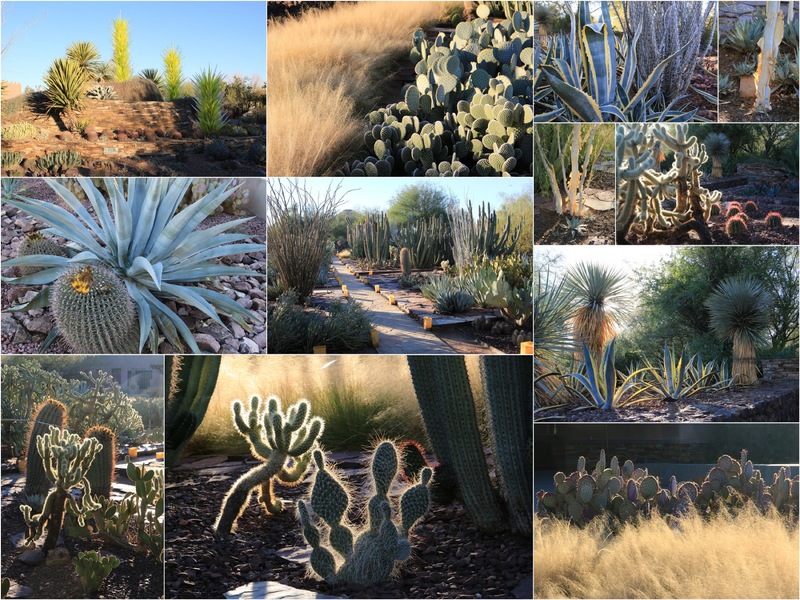 It truly is one of my favorite plant places to visit. And since I don’t come here that often, it never gets old. I do recognize individual plants now (“hey, old friend”) but they’re constantly improving and refining. Unlike so many other botanical gardens, the DBG appears to be well funded, which warms my heart. 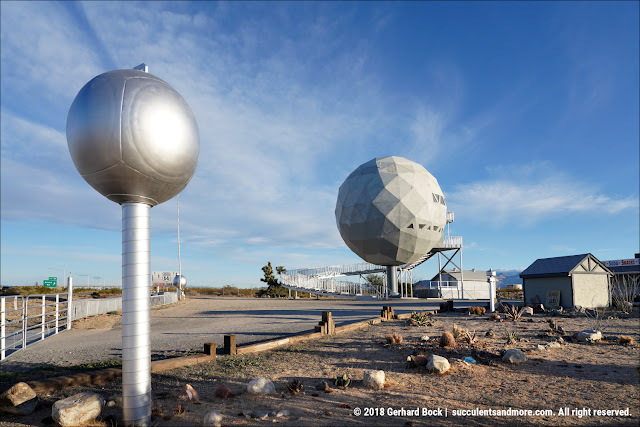 In the early afternoon, I left Phoenix and headed southeast towards Tucson. But this year I made a stop about half way, visiting Facebook friend BJ Seemuth in Casa Grande. BJ and her husband moved there from Chicago about 10 years ago. 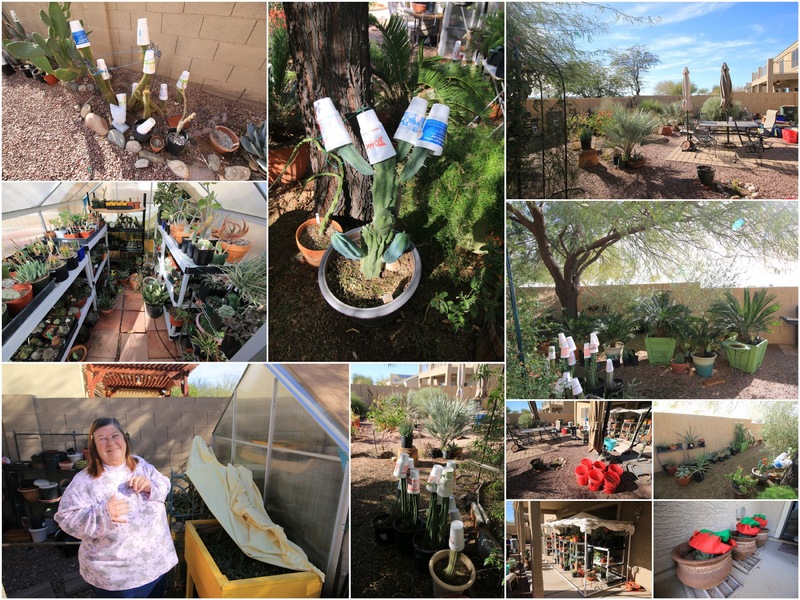 She’s a master gardener and works at the Pinal County Cooperative Extension of the University of Arizona College of Agriculture & Life Sciences, teaching classes on subjects like plant propagation and advising homeowners on garden-related matters. She is a true succulent fanatic. 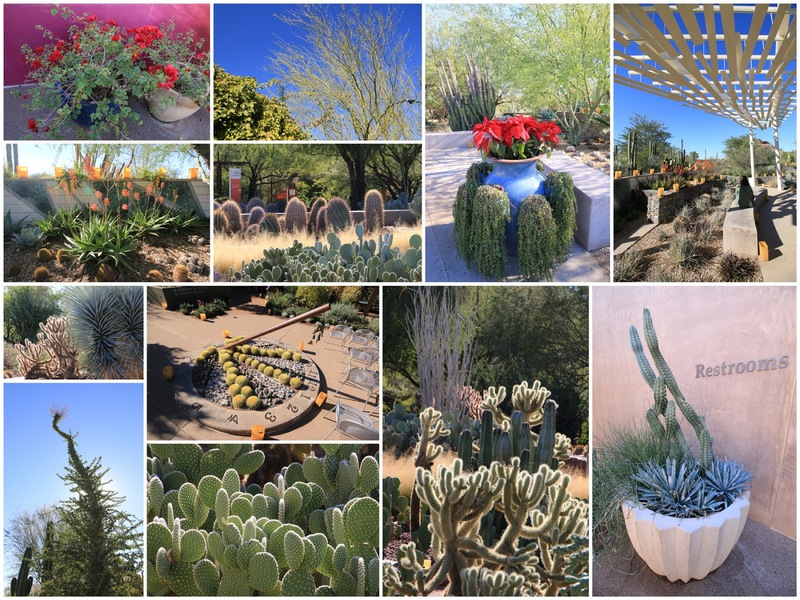 In addition to the many cactus planted in the ground, she has a large collection of potted succulents that overwinter in a small greenhouse and racks under the eaves of the house. While it was 68°F when I was there, Casa Grande can get frost into early March. 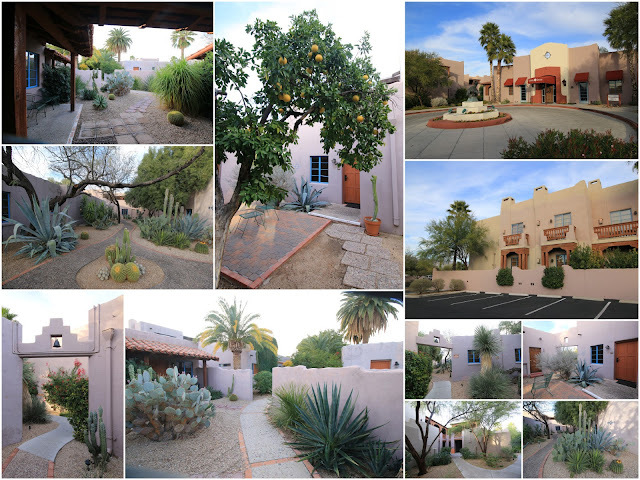 I arrived in Tucson with an hour of daylight to spare so I took photos of the landscaping at the Lodge on the Desert where I’m once again staying. Last year most of the cactus were covered with Styrofoam cups to protect their growing tips (see the collage of photos from BJ’s place above). This winter must be much warmer in Tucson because there’s not a single Styrofoam cup in sight. 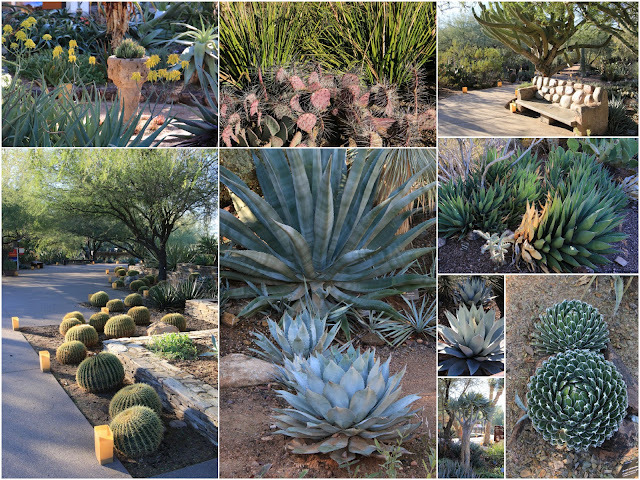 Tomorrow’s agenda is packed: Tucson Botanical Garden, Plants for the Southwest Nursery, Arizona-Sonora Desert Museum. In the winter, there aren’t that many hours of daylight so I always seem to be on the go. Strangely, as much as I hate being in a hurry at home, I don’t mind when I’m on vacation. I swear I don't understand what's happened to customer service - from someone who once worked on the front-end of service delivery, it appears that it's become a lost art form. I'm glad your travel problems didn't entirely upset your trip at least. You photo montage speaks of a great trip. I'm not sure you can find sky bluer than that shown in your photos of the DBG. Have a great time! Some customers at the Hertz counter were very vocal about their displeasure. One guy (late 20s, very cocky) was told by a Hertz employee that his language was not acceptable and to please step outside. Ouch. For my part, I thought it was prudent to be calm and patient (at least outwardly), otherwise they might have made me wait even longer. Sue, when I contacted them a couple of years ago about 'Chilly Willy', they only had it in 5-gallon containers, which they weren't able to ship. Last year I asked when I was at the nursery and they said it wasn't in production. I'll check today if I make it out that way (not sure yet). Maybe they have smaller sizes. Well, since the plans for my December trip to DBG blew up, your visit and posts are very timely! Looking forward to more, please. Sorry to hear your plans fell through. The DBG isn't going anywhere--just getting better and better! I'm glad you didn't post too many of your own photos from the DBG so I wasn't tempted to copy them. But now I can't wait to see what you did! I'm sure we photographed many of the same plants, but in completely different ways. So love your posts and pictures of your Arizona trips. Sorry you won't be coming through the Coachella Valley this year. Thank you, Bernie! No time this year for Palm Springs BUT there's a good chance I might visit in February. Have fun! Enjoying your photos. Another year when Arizona is not on the agenda for me dammit. When I do finally go I can at least refer back to all your informative posts ! I used to rent from Hertz , but I have had great luck the last several times with Budget believe it or not. Nevertheless surliness seems to have become much more common in the world of travel. 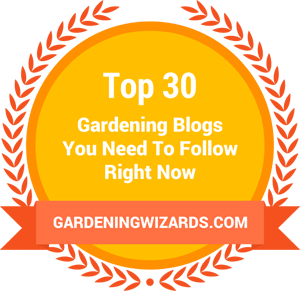 I try to write posts that I would find informative if I found them elsewhere. You have such a great eye for capturing amazing photo compositions, I am always impressed with what you shoot and share! Thanks for sharing this latest visit, it's been too long since I last got to Arizona. David, that's the best compliment I've gotten in many a moon. Thank you! That's what I try to do, and I'm glad I'm succeeding, at least sometimes.